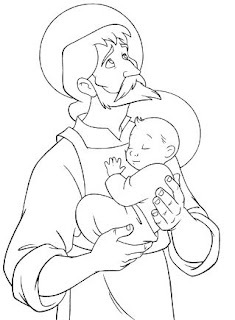 St. Joseph Free Printable Coloring Book! Print your free St. Joseph Coloring Book here. I have a post with more free St. Joseph printables here. Wow! Awesome! Thank you for this! St. Joseph has been such a wonderful intercessor for our family. The children will love these! OH! Thank you so much for sharing this!!! When I visited the Holy Heroes site on 9 Apr 2011, the coloring page was about Mary, not Joseph. Perhaps they change the page periodically. I just visited the Holy Heroes page (3/13/2014) and now it’s St. Kateri. Sadly, the St. Joseph coloring book doesn’t even seem to be available to purchase at the site. If anyone knows where this can be bought or downloaded from now, please post in the comments here!